A new sensation who surpasses nations and generations, “Hemenway” enters the scene this autumn with their captivating melodies. The four members first met while attending the Berklee College of Music in Boston, Massachusetts. After their graduation in 2008, the two Korean-Americans, Isaac and Charm formed a song writing team as they went back to their homes in LA. Growing up with great influences from Japanese music and culture, Isaac and Charm were determined to pursue their music careers in Japan. Finally, in summer of 2010, the two set their foot in the land of their dreams. As classmates Toshi and Ogaching reunite in Japan and start a band, “Hemenway” begins to pave their way in the music industry. 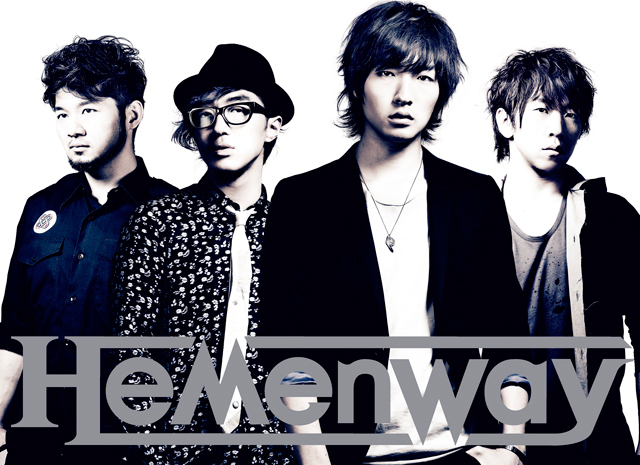 The name “Hemenway” comes from a street name in Boston, where the four members lived close by and had unforgettable memories. With their love for the Japanese culture and their ability to freely manipulate three languages (Japanese, English, and Korean), “Hemenway” will continue to pursue and create a whole new wave of music.